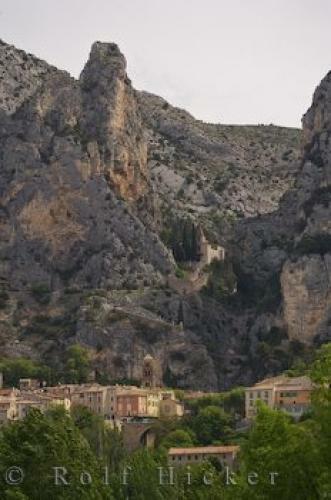 Notre Dame de Beauvoir watches over the village of Moustiers Ste Marie in the Alpes de Haute, Provence, France in Europe. in Moustiers Ste Marie in Provence, France. ... Notre Dame de Beauvoir was renovated in the 16th century and nowadays one can stand on the church porch and look down on the roofs of the village of Moustiers Ste Marie and the valleys beyond.The village of Moustiers Ste Marie watched over by the 12th century Notre dame de Beauvoir, Alpes de Haute, Provence, France, Europe. I photographed this photo with the digital SLR camera model Canon EOS-1Ds Mark II, aperture of f/6.3, exposure time of 1/200 sec. on ISO 100, as always I used a original Canon Lens, the focus lenght for this picture was 150mm.